21 June 2014, Singapore – With just three months to the 2015 FORMULA 1 SINGAPORE AIRLINES SINGAPORE GRAND PRIX, race promoter Singapore GP Pte Ltd successfully kicked off their first Rev Up Singapore! initiative for the year with the Karting Training Programme and Championship. The first in a series of initiatives aimed at sharing the excitement of Formula One™ across the island, the Karting Training Programme culminated in a go-kart championship on 21 June. Back for the second year, the Karting Training Programme reached out to 200 participants with no prior karting experience, up from 120 last year. Designed to introduce karting – a sport most Formula One™ drivers consider as the first step to professional racing – to the youth, the campaign attracted close to 500 entries from aspiring local racers aged 14 to 21. Held at the KF1 Karting Circuit over four days, participants who successfully balloted for a place attended a fully-sponsored training session, comprising theory and on-track practical lessons conducted by instructors from the Singapore Motor Sports Association. Competing in two age categories of 14 to 17 (Junior) and 18 to 21 (Senior) on the challenging 560m track, Lachlan Russell, 14 from Australian International School won the Junior Category while Phua Chun Boon, 20 from Singapore Polytechnic took the trophy for the Senior Category. “I went into the competition not knowing what to expect. Now that I’ve won the Junior Category, I’m super stoked on what is to come,” said Lachlan Russell. “The win was totally unexpected and it’s like a dream come true where I can finally go into racing. I am looking forward to competing in leagues to see where I stand and improve with every race,” said Phua Chun Boon. 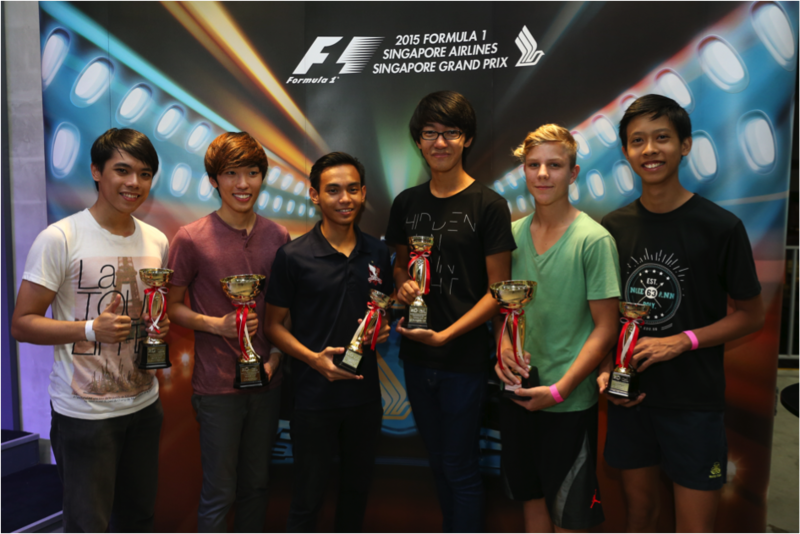 The winners each walked away with a one-year scholarship by Singapore GP Pte Ltd and KF1 Pte Ltd, consisting of a Singapore Motor Sports Association karting license, practice sessions at the KF1 Karting Circuit, full race gear, entry to the 2015 KF1 official races in Singapore and a pair of tickets to the 2015 FORMULA 1 SINGAPORE AIRLINES SINGAPORE GRAND PRIX worth over S$14,000 (per person). Other fan-friendly initiatives lined-up under the ‘Rev Up Singapore!’ campaign include a Thursday Pit Lane Walk, Behind the Scene tours, FORMULA 1.101 Talks, Singapore GP School Visits and more exciting programmes will be launched in the coming weeks. For more information on the upcoming initiatives, fans can visit www.revupsingapore.sg or follow Singapore GP Official Page on Facebook or @F1nightrace on Twitter and Instagram for the latest updates.